If you are looking for a simple, fun, exciting and yet challenging casual game to play on your smartphone, there hundreds of games you can choose from. One of the best choices are definitely the endless tap games which are offering you all you need to get hooked to playing and test your skills. To save you some time in your search, we did our research and we discovered an incredibly exciting and addictive endless tap game that will challenge your skills. 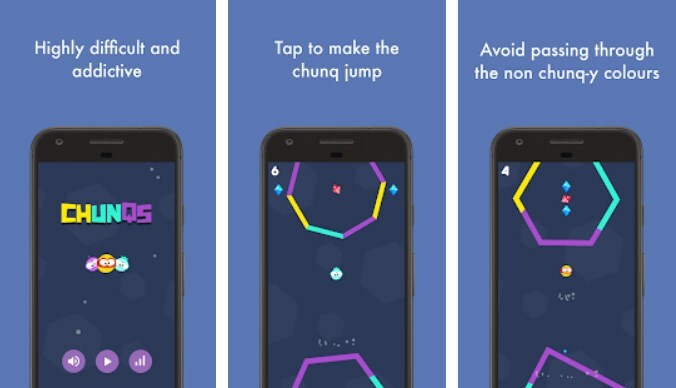 Developed for Android users, Chunq is an endless tap game that’s quite challenging and very addictive at the same time, allowing players to enjoy tapping and jumping while testing their skills each time they play. The gorgeous sharp graphics and the fun sound effects will keep the attention of players while he tries to tap and make the cool Chunq jump through the obstacles and survive in the game as long as possible. Players need to react and tap fast to jump and pass as many challenging obstacles on the way. Chunq is perfect for all tap players and lovers. This game is getting players hooked on their first try by requiring them to tap to make the Chunq jump and pass the challenging obstacles in order to survive in the game as long as they can. Players just need to tap, jump and pass the obstacles on their way but at the same time being careful not to pass through the obstacles that don’t match with the Chunq’s color. As the player progresses, the color of the Chunq is changing faster and faster, pushing players to react fast to match the color of the Chunq with the correct color of the obstacle to pass. When the player successfully passes an obstacle he is getting scores for his achievement. Also, on the way up there are diamonds that need to be collected and each player needs to try and collect as many of them as they can to get high scores. You need to survive as long as they can, jump with the Chunq through the obstacles and collect the diamonds to get the highest scores and become the best tapper of the game. Download the game for free on Google Play to react and tap fast to jump with the Chunq and pass the obstacles!